Sometime in life, we master skills or activities and forget about the fun and success that was involved in getting to that point. We no longer appreciate the improvements that helped us, or the times that our successes made us feel super-human. Along the way, we lose the appreciation for the things we CAN do, and only focus on our mistakes or hesitations. 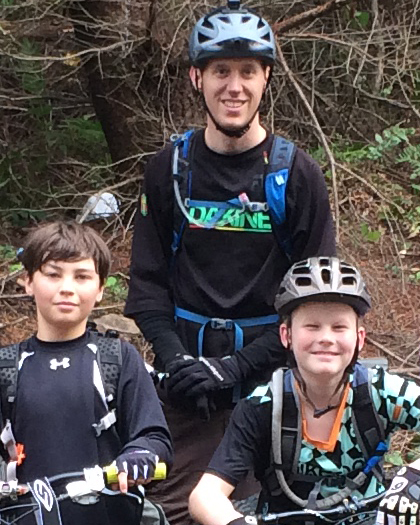 This fall I had the amazing opportunity to start the first Whatcom Mountain Bike Coalition school-based ride club, and along the way I was reminded of all of the great successes that young riders so often feel as they learn to embrace this wonderful sport. As a 6th grade teacher at Whatcom Middle School, I’m surrounded by young adolescents who are constantly yearning to find their niche and figure out who they are. They know that I ride because I have posters and pictures around my classroom, I talk about riding, share weekend Whistler anecdotes in the spring, and occasionally have my bike at school. It becomes quickly apparent that to at least a few of them, I embody some sense of “coolness”. They have bike company stickers on their binders, they talk about Pinkbike videos, and some even post their own Cornwall Park and Galbraith videos. When I was approached last year about the possibility of starting a school riding club, I was on board instantly. As with any administrative position, there was lots of paperwork, meetings, and time-consuming work in getting to the first day with the riders. Seeing how excited the riders were as they stopped by before and after school to ask questions made it incredibly easy to put in the time and effort to get everything ready. I spent myFriday afternoonshelping the riders understand trail etiquette, simple riding techniques, and the joys of being on bikes. However, most of them picked up on that third part all on their own. It became obvious that just being on the bike was the best learning tool for our beginner riders. Coaching and instruction were helpful, but the best learning moments came from just letting them ride. My highlights from our club were often situations that I was only in because I was riding with a group of beginners: the wettest, rainiest, longest forty minute Saturday ride I have ever been on; hitting jumps on Mullet four times in a row because a group of 11-13 year-olds wanted to watch it again and again; spending thirty minutes practicing rolling or jumping off one-foot-tall log drop; and hootin’ and hollerin’ in a 20 rider train on the flattest trails on Galbraith. Through the entire fall, I watched the riders have successes and first moments that happened for me long ago, ones that I have since forgotten about and now take for granted on my own rides. They showed me that I’ve been missing my own moments on the trail, and need to take the time to focus on the small successes that I have all the time, on every ride, multiple times per trail. They have reminded me that it’s not about the next big thing on your riding checklist. The joys of riding should come from every foot of trail andevery minute of riding. The riders were always thankful and appreciative for the time that we gave them during our club, but I neglected to express my thanks to these young riders for helping me to regain aperspective and appreciation of our sport that I’d forgotten. I owe them. I’ll make sure that I express my appreciation the next time I see any of them in the hallway.